From a photo I have taken or from a found image in a book I respond to the visual images that are around me. I will juxtapose an image or part of into a new environment to allow the viewer to interpret as they wish. 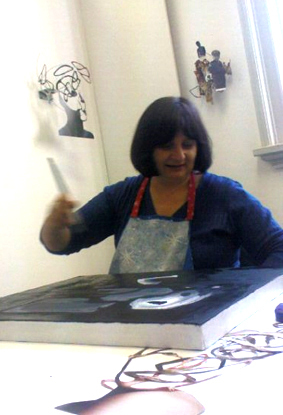 I have a Diploma in Visual Art as well as a Bachelor in Fine Art (Drawing) from RMIT University (2009). I am currently exhibiting, part of Alphington Open Studios, the Out of the Box group of artists and teaching mixed media, digital, collage, assemblage, drawing workshops from my studio. Hi Anne, thank you for visiting my blog and liking my “End of summer scramble” post. It has given me the opportunity to check out your blog, and so far I am really enjoying your art work. Likewise – a great chance to see your work. Thank you Anne, for liking my post of today! Love your work! Thanks for visiting my blog. Thankyou Joe. After reading your blog I want to say great work and great generosity in sharing your process. Artists are generous aren’t they. Hello Anne, thanks for visiting 1421art. Especially enjoyed your ‘drift’ piece. Appreciate any WOM on FWPM. Continued treasures in the environment! I really like the man with the building on his back. So thought provoking! Thankyou. Glad you got it and that it is a cycle. Thanks for the like on my Reptilian doodle. Greetings Anne. Thank you for liking “The Circumference of Thought”, and enabling me to connect with your art. Hi Anne, Thanks for stopping by my Daily Record 365. I’m looking forward to exploring your gallery. Great work from what I see already! Love it! Hi Anne, Thank you for visiting my blog and ‘liking’ it. I am new to blogging so it is very exciting to get comments etc! I am hoping to connect with a community of like-minded artists who are interested in/working in the area of environmental art. I don’t know whether you visited one of the blogs I follow. It is by an American artist who photographs his creations of found rubbish on the Ohio river. It’s a fabulous blog and well worth a visit. I have been posting pics etc for a number of years now and am so not a tech person. I got stuck with gravatar which I still dont get. I googled it and still couldnt get to you. Good luck with everything – maybe you can teach me. By the way I am gifting alot of pieces this Christmas to people I don’t usually give gifts to. Just hope they don’t give me anything back. I will go through your blog to find the name of the artist you mentioned. Hi there! Thanks for following my blog. I really like your artwork! Thanks for dropping by on my blog. Love the collage work, I use collage alot in my work as a teacher….extra ideas are always welcome! You’re welcome Peter. I enjoyed your site and your insight into education. I have never done anything as big as you have however just today I made a submission to have my work on a tram. I must wait now to see if I will be selected. Good luck with that Anne…pictures on your blog of the tram in the future hopefully! Please send me more information as I am always interested in showing my work at new events. Hope to hear from you. Thanks for visiting my blog! I love the range of your work. Your soft still life paintings are quite appealing, and your collages definitely have a humorous twist that I like. Hello, my name is Holly and I am studying A level Art and I came across your gallery. I especially like the piece you did with circles and parts cut out. It would be most appreciated if you would tell me what inspired you to create this piece of art. I have been inspired by this piece of work and currently working on my own cutouts in tights. Hi Holly I started with found images of faces and started to cut more and more of the image away until it was almost reduced to just lines. I was excited to find that the image although abstracted could still be read quite easily by the viewer. I studied drawing at University and my Lecturers said I was drawing with scissors. The cutout shapes became more and more abstract for me when I was cutting and there was a steam of consciousness thing happening. I regularly make avgolemono soup and love it. I learn’t to make it from my Greek mother. I appreciate that you have acknowledged changes to the traditional. It was always a white soup so it never included the yolks. Anne, that’s so interesting — I’ve never seen it with just the egg whites! I wonder if it’s a regional thing? Interesting work Anne. Thanks for stopping by at the Pinacoteca and liking my site, appreciated.